A small bronze equatorial dial made by Victor E. Edwards in the 1920's. It has an unusual crescent shaped arm with notch at the upper end. The arm is rotated until sunlight through the notch strikes an analemma on the lower inner curve of the crescent. Time is then read on a circular dial from an "hour hand" pointer extending from the base of the crescent. The dial is mounted on a granite pedestal with spherical top 21 inch high. A combination horizontal and equatorial dial. Stainless steel equatorial ring is 8 feet wide x 10 feet high. Equatorial gnomon extends to cement face of horizontal dial. Bronze plaque provides a table of corrections for EOT and longitude. Identified as the William H. Hausdoerffer Sundial to honor Dr. Hausdoerffer, Class of 1936, Professor Emeritus of Mathematics, Department Chairman, Dean of Men, TSC Athletic Hall of Fame, Alumni Executive Board and adviser to many groups, serving from 1940 to 1979. Equatorial in bronze. 2 meters in diameter. Arabic hour numerals. Hour scale is subdivided into 5 minute intervals. A horizontal dial on the ground, with an hour circle about 12 feet. The gnomon is of steel, about 4 foot high. The gnomon is oriented to magnetic north. It is not an accurate device. Three boulders surround the dial and cut off the shadow much of the time. Gravel hour circle has rocks to mark the hours, but the rocks can be moved and are strewn all about. More suggestive of a dial than a real dial. A horizontal dial 16 inches in diameter located beside the observatory, just outside the museum. Includes hour markings for EST and DST and an EOT graph. Hour lines corrected for longitude. Mounted on a 24 inch high pedestal low enough for children to enjoy. An equatorial dial built by Erickson Monument Co in 1974 for the War Veterans Memorial Park. Dial is 6 feet in diameter made from granite. The gnomon rod of about 3 inches diameter is stainless steel. Hour, half hours, quarter hours and five minute marks show the time. For symmetry, the face has hours marked for the entire 24 hours, though in Florida the excursion of time from 6am to 6pm is relatively small. The hour lines are rotated for the site longitude. Henry Moore Sundial Sculpture: 13 foot bronze equatorial dial built in 1980. Two bronze semicircles, one set inside and at right angles to the other, form the main elements. A slim rod runs from one end of the outer semicircle to the other end and its shadow on the inner semicircle below marks the time of day. EOT correction is provided. Conical dial 120 ft. high, 122 ft. diameter at base and has an 85 ft circular opening to the sky. In the middle of the opening is a spherical nodus that casts its shadow into the concrete structure. According to the Guinness Book of Records in 1995, this is the world's largest sundial. Designed by Isozaki and calculated by Ross McCluney, the sundial is a large truncated, slanted cone, with hour markings on the inside. McCluney was NASS's first president. Once, high on the physics building south wall was a student made vertical dial. The 5'x8.5' resin coated particle board made by Mark Kearns in 1979 had curved hour lines to account for the equation of time, declination of wall, and offset from standard meridian. This dial has not been on display for some time. Perhaps some student would create a new dial. The brick wall is an excellent location. Horizontal dial 12 in. square designed and built by David Shayt and David Todd of the Smithsonian Institution. Roman numerals, 5AM-7PM. Subdivided into 15 minute increments. Also has compass rose. 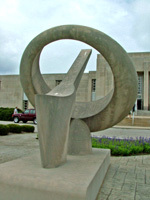 Dial sits atop a rectangular granite pedestal. A 40 inch diameter armillary on a 2 foot tall cement cubic base. The original analemma-shaped gnomon was missing and replaced with a section of loose ordinary electric wire. Includes a longitude-correction plaque showing the corrections throughout 15 degrees longitude. Dial sits atop a 26 inch high, 26 inch square pedestal. Robert Allen states that this dial is a scaled down version of the one at the San Diego Zoological Garden, and that there is a similar one at Williams College in Williamstown MA. Approximately 6 foot diameter bronze armillary dial with equatorial, meridian and equinoctial colure rings and with Arctic and Antarctic circle rings. Hour lines have 5 minute marks and Roman numerals. Equatorial ring has Zodiacal signs. Base shows the Great Seal of Texas and includes a bronze eternal flame. Names of fallen heroes are inscribed on the base and paths to and from the dial lead to location of Sam Houston's troops prior to the battle of San Jacinto. The San Jacinto Monument is seen in the distance. A half-cylinder equatorial dial whose body structure is exactly the same as the one (#28) at Trinity College, Hartford, CT, only the pedestal here is lower. Named ?The Camp Columbia Sundial?, a gift of Camp Columbia to memorialize Dean Hennessy (1917-1991). Armillary dial about 3 ft. diameter designed by Don LeGrande. 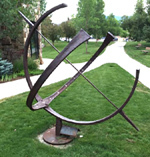 As of Christmas 1992, a stunning armillary sphere-type of sundial ... The framework of the dial is constructed of burnished stainless steel. ... The rod-like gnomon was destroyed by vandals many years ago, but the rest is in good shape. This is not the Koester dial at SDSU, but a far more interesting horizontal dial originally dedicated to the San Diego Normal School for elementary teaching by the class of June, 1911. The 18-inch octagonal bronze dial was originally designed by San Diego Clock maker Joseph Jessop and mounted on a miniature Doric column. The dial was placed within the circular lawn directly in front of the school's main entrance at the intersection of Park and El Cajon Boulevards.